Algernon Cargill, Director of NIB told members of the Rotary Club of Nassau this week that that Phase I of the National Prescription Drug Plan has been going very well and he believes NIB will be able to launch Phase II of the Plan earlier than expected next year because of the success of Phase I. “In terms of the first six weeks of the plan we’ve registered more than 13,000 people so we have 40% of our target members already registered. We have 36 private pharmacies now. Quite a few pharmacies who were originally hesitant are now signing on because the good news about the plan is spreading. That’s 70% of our target pharmacies and certainly these 36 private pharmacies are enough to run the plan. We will accept new pharmacies coming on but we don’t need any new pharmacies to make the plan successful,” Mr. Cargill said. Mr. Cargill said payments to the private pharmacies have averaged around $16,000 per week and last week jumped to approximately $24,000. He also stated that the private pharmacies are pleased with the fact that they are being consistently paid on time. “The National Insurance Board agreed and contracted that we would pay weekly and since the Plan was launched in September I’m happy to say every week we’ve paid on time; as a matter of fact a day early. We’ve paid all of the private pharmacies for providing the medication to the patients on our behalf and the way we pay is we direct deposit the funds into their account electronically,” he said. According to Mr. Cargill the Plan is now electronically processing approximately 400 claims per day with a 20% rejection rate compared to rejections of over 50% in Jamaica during the same introductory period and Jamaica’s current rate of approximately 50% rejections. Mr. Cargill also indicated the most common reasons for rejections. “If you have a prescription for a drug that is not on the formulary then the prescription claim will automatically be rejected. It won’t be honoured or, if you, for example have diabetes and your doctor did not confirm that you have diabetes and he writes a prescription for diabetes we cannot provide drugs to treat diabetes. The doctor has to confirm all of the diseases you have and once he or she has confirmed a disease you’re automatically covered for any of the drugs the plan provides for treating that ailment,” Mr. Cargill said. Talking about some of the challenges experienced by the Plan in the first six weeks Mr. Cargill said quite are few beneficiaries have been very slow to collect their cards and the public pharmacies have not been very active in sending in claims. Further he said some members have attempted to fill prescriptions for conditions for which they are not registered and some doctors did not write or stamp their names on prescriptions. “The first point of authorization is to confirm that the doctor is registered with the Medical Council of The Bahamas. We have to have the doctor’s name. For example if you went to the hospital or the clinic and sometimes the prescriptions are written Dr. PMH or Dr. South Beach Clinic, that’s not a registered doctor so we need to know, for example, Dr. Bowe at the Princess Margaret Hospital is the doctor who signed the prescription. So we have to encourage the hospital to have their doctors to stamp their names or write their names on all of the prescriptions they write,” Mr. Cargill said. “And so the Plan is here. It’s a permanent Plan. It’s a permanent benefit. We’re in the first Phase of the Plan and we hope to move to Phase 2 sometime next year. I think we’ll be ready earlier than we projected for Phase II because Phase one is really going very well,” Mr. Cargill said. Mr. Cargill also indicated that NIB will very soon roll out the pilot project for its Healthy People Programme, the second component of the National Prescription Drug Plan that seeks to prevent disease and promote healthy lifestyles. DRUG PLAN ROTARY ADDRESS – Algernon Cargill, Director of the National Insurance Board recently addressed the Rotary Club of Nassau on the details and progress of the National Prescription Drug Plan. 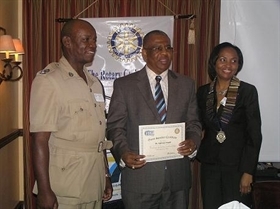 Pictured above Mr. Cargill (centre) received a certificate of appreciation from Stephen Dean (left) member, Rotary Club of Nassau and Racquel Wallace(right), President, Rotary Club of Nassau.